"Allen Carr's Easy Way to Stop Smoking" is the one that really works. It is the world's bestselling book on how to give up smoking. 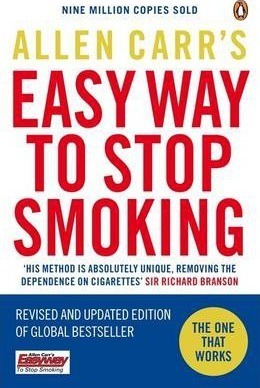 And this is the original and still the best edition of his classic book on how to give up smoking the easy way. Over Nine Million Copies Sold Worldwide. 'It didn't take any willpower. I didn't miss it at all and I was free' Ruby Wax Read this book and you'll never smoke another cigarette again. The unique method: no scare tactics; no weight-gain; the psychological need to smoke disappears as you read; and feel great to be a non-smoker. Join the 25 million men and women that Allen Carr has helped give up smoking. "Achieved for me a thing that I thought was not possible - to give up a thirty year smoking habit literally overnight. It was nothing short of a miracle". (Anjelica Huston). "Instantly I was freed from my addiction. I found it not only easy but unbelievably enjoyable to stay stopped". (Sir Anthony Hopkins). "This guy's brilliant. And I haven't smoked since". (Ashton Kutcher). Special offer: Recover the cost of this book when you attend an Allen Carr Clinic. Allen Carr was an accountant who smoked 100 cigarettes a day until he discovered easyway. Having cured his own addiction he went on to write a series of bestselling books, most famously "The Easy Way to Stop Smoking". His books have sold more than 13 million copies worldwide. Allen's lasting legacy is a dynamic, ongoing, global publishing programme and an ever-expanding worldwide network of clinics which help treat a range of issues including smoking, weight, alcohol and "other" drug addiction. Allen Carr was an accountant and smoked 100 cigarettes a day until he gave up and wrote this bestselling book. He has built a hugely successful network of stop-smoking clinics across the world and is the author of The Only Way to Stop Smoking, How to Stop Your Child Smoking, The Easy Way to Enjoy Flying and The Easyweigh to Lose Weight. Carr was diagnosed with lung cancer in the summer of 2006 and died in November of the same year. It seems likely that the years he spent curing smokers in smoke-filled sessions at his clinics must have contributed to this illness, but Carr remained positive.